All of the built in interior furniture is part of the structural integrity of the boat to add stiffness. Forward, a large area accessible via hatches under the mattress. This area is plumbed for a 25 gallon flexible water tank. 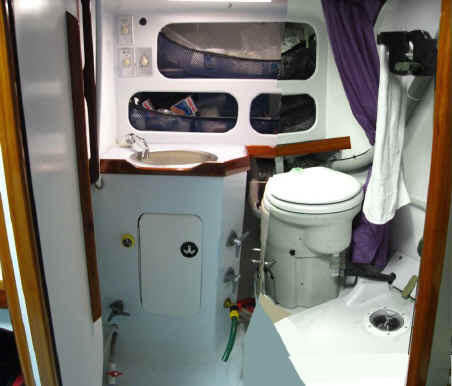 Aft part of berth has large open storage space with the opening above the water line, and the transducers in the bottom under a protective flap. Vents in chain locker and ports in forward bulkhead allow air into forward cabin while raining. These ports must be kept closed while under sail in rough conditions. Top of fabric is under tension with shock cord. so the fabric can be pulled down out of the way. The depth of the curve of the top can be easily adjusted for the conditions. There are more storage shelves on the starboard side. Wringer also acts as a towel rack and handhold. Composting Toilet composts solids in toilet base. Shower curtain keeps shelves and toilet from getting wet during shower. Showering can be either with fresh water from the sprayer or recirculating shower. See the plumbing section for system details. Port settee "L" shaped extending along port side and forward bulkhead. Water tank vents are on the top shelves in the forward cabin. This eliminates the chance of salt water contamination from exterior vents. Check valves keep water from surging out in heavy seas. Water tanks fill from ports under settee cushion. Each port is large enough to reach through and scrub out entire tank. Work table folds up from keel well, and when open there is just enough room to squeeze by between chart table without having to close work table. The propane safety switch is located in easy eyesight when leaving the boat. The dish cabinet is located over the sink, and has a drain pan under it so dripping water will drain to the sink. Washed wet dishes can be put away and don't need to be moved after they dry. A garbage bin fits under counter against the aft bulkhead adjacent to the sink cabinet. All sides and hatches use R-50 vacuum insulation panels for insulation. Frig-a-boat cooling system using a Danfoss compressor, and a Keel Cooler. The Keel Cooler mounts underwater and cools the compressed freon without the need of cooling water and pumps. There is an air and water tight aluminum divider between the refrigerator and freezer. There is a 1" thick foam composite shelf held 1" above the aluminum divider. This shelf forms the bottom of the refrigerator. On the back wall is a thermostatically controlled fan that takes air from the top of the refrigerator and blows it into the space between the cold aluminum plate and the insulating shelf when the thermostat signals that the refrigerator needs cooling. The advantage of this spillover system is that there is no moisture exchange between the warm moist refrigerator and the "cold dry" freezer which causes a buildup of frost in the freezer. The disadvantage of any spillover system is that it takes more energy to put cold into a freezer than a refrigerator, so it is wasteful to then take that high energy cold and put it into a refrigerator that could just as well used low energy cold. The advantage of any spillover system is that only one compressor and evaporator is required, and the additional complexity of the spillover fan and thermostat is trivial. The refrigerator box can slide out of its built-in housing so if a vacuum panel fails it can be replaced with out ripping the cabinetry apart.